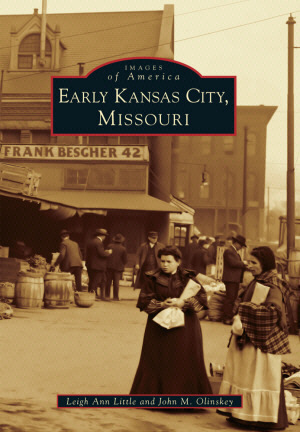 There are more pictorial histories of Kansas City than I can count, but Prof. Ulichne and I have added our own contribution to the historical record of this town in the just released book from Arcadia Publishing called, "Images of America: Early Kansas City, Missouri." We are hoping that even the stoutest Kansas City history buffs will open this book and say (more than once), "I never knew that!" Another goal in doing this project was to call attention to people and things that have been forgotten or diminished in the official narrative. In many books about local history, Thomas Bullene is called an early settler and a shopkeeper, if he's mentioned at all. Theodore Case, if mentioned, is generally referred to as a physician. These men were so much more than that, and their impact was lasting and should be remembered. There are numerous examples of people such as these that all Kansas Citians should grow up learning about in school, but instead these early leaders have largely been forgotten. There are also a few pictures and stories of some people whose names grace our roadways. We see their names every day, but who were they? And in at least one instance, we're hoping readers will wonder why we continue to honor people whose behavior might not have warranted such a lasting legacy. P. S.: You can get an even closer look at early Kansas City history by reading the news of the day... from back in the day. Looking forward to buying this one!!! Cannot wait to check this book out. I love KC books. Cant wait to read the book I will be looking for it right away.